(Newser) – A big plane got into a bigger snag last night when it mistakenly landed at a tiny Kansas airport, only to find the space too tight to turn around in. 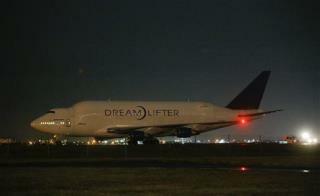 The Atlas Air Dreamlifter was scheduled to land at McConnell Air Force Base but instead touched down at Jabara Airport—which boasts a runway just 100 feet wide—eight miles away. Though given clearance from McConnell, the apparently confused, two-person crew was heard saying, "Ahh, yes sir, we just landed at the other airport," KWCH reports, while NBC News took away this quote: "Let me ask you this, how many airports...are there?" It is highly possible to land at an airport too short to take off again. That's considering the use of engine reverse thrusters to slow down. Then taking off again can't be achieved due to lack of runup space. Breathtaking ineptitude. These boys got some splainin' to do.